Dermatology Clinic for Animals and Dr. Coyner are excited to now be able to offer Medical Acupuncture as complementary care to help treat our patients, reduce their symptoms and medication needs, and improve their quality of life! Medial acupuncture is based on the complex relationships between nerves, muscles and blood vessels in the body. With acupuncture, we are facilitating communication within the body through various pathways. Careful physical examination and muscle palpation can indicate areas of strain or pain which may indicate underlying disease and guide needle placement into affected areas, as well as into acupuncture points which have increased nerve supply to communicate with the rest of the body. When we insert needles into the skin and muscles, we get both local and whole body systemic effects. We’re neuromodulating the nerves that enter the spinal cord and brain and overriding painful responses. An example is when you hurt your hand and firmly massage and rub it – it makes it feel better because you’re creating a different feeling. Needle insertion creates local effects, such as increased circulation and local cellular production of messaging molecules, which through various signals can create an anti-inflammatory effect throughout the rest of the body. Messages travel up the local nerves into the spinal cord and brain and produce responses through the entire system as nerves communicate. We can use this for muscle pain and trigger points, nerve pain, and organ dysfunction, and we can use this for both acute and chronic concerns. 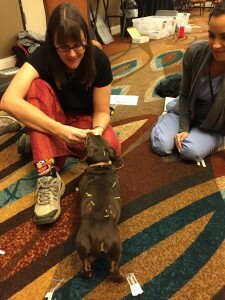 Acupuncture truly lets us tap into the animal’s own pharmacy. Low-level laser therapy (LLLT) (also known as cold/cool laser or therapeutic laser) is a form of laser medicine used in physical therapy and veterinary treatment that uses low-level (low-power) lasers or light-emitting diodes to alter cellular function. Therapeutic laser can have positive effects for acute and chronic pain, wound healing, and inflammatory conditions. Whereas high-power lasers ablate/destroy tissue, low-power lasers can stimulate it and to encourage the cells to function. The light energy from laser’s photoirradiation leads to photobiomodulation, a process involving a cavalcade of photochemical events that alter cellular physiology/function, intercellular signaling/communication, and increased mitochondrial activity. In wound healing, the heightened mitochondrial activity in the cells speeds skin closure by increasing collagen and blood vessel production.